Think SDCC owns the concept of comic con? OK then. Guess if this is SDCC or FanX. Let’s start off with a massive disclaimer: I’m from Utah. I’ve attended every single Salt Lake Comic Con and nearly every FanX event we’ve had in the last six years. So I’m obviously going to be a little biased here. I’ll try to be as objective as possible, but the fact of the matter is that I’m going to view this as a citizen of Utah and there’s little I can do about that. So, in case you are in the dark on the whole “Battle of the Cons” let’s give you a brief recap. In 1970, the first San Diego Comic Con was held in a hotel. It had 145 attendees and was used as a mini-con fundraiser for the ‘actual’ event later that year. The ‘actual’ event had a turn out of 300 people. 1995: Following an unsuccessful attempt to get a trademark for the term “comic con”, SDCC rebranded to San Diego Comic-Con (which they CAN actually trademark). 2005: Attendance for SDCC surpasses 100,000 attendees for the first time. 2013: Salt Lake Comic Con has its first event. It receives an estimated 80,000 attendees and breaks all previous records by a convention in Utah. 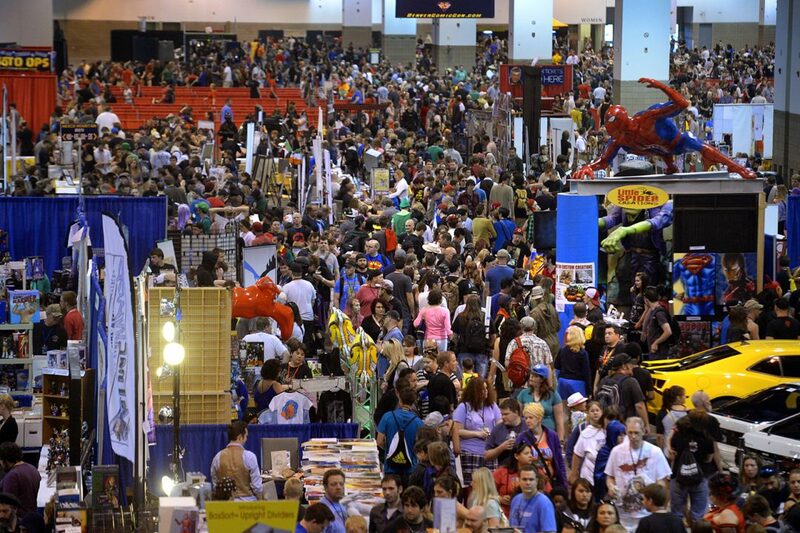 It is the largest inaugural comic con ever, the fourth largest in the world, and the third largest in North America. 2014: San Diego Comic-Con International sends a cease and desist letter to Salt Lake Comic Con alleging trademark infringement. 2017: After around in court, a jury found that the ‘comic-con’ trademark could be extended to also include ‘comic con’ and that Salt Lake Comic Con did infringe on that trademark. However, they could not determine that they did so intentionally or that it damaged the SDCC brand in any way. The organizers of SLCC were ordered to pay $20,000 in damages (far short of the $12M SDCC was suing for) and agreed to rename the Salt Lake event. That’s the super short version of things, and it’s hard to see that and not feel like SDCC was more upset that SLCC was popular than they were worried about their brand. That should have also been the end of it. Salt Lake Comic Con’s Facebook page and website have been re-branded as FanX. Both SDCC and FanX are gearing up for their 2018 cons (sorry, “conventions”). Life goes on. It was held in San Diego. Much like my disclaimer above, the denizens of San Diego were likely to view SDCC more favorably and be more familiar with their own event. That’s to be expected, which is why a trial like this should be heard in a neutral location with an impartial jury. Worried that Dan Farr Productions were better at using social media than them (no, seriously), SDCC made a motion to block them from saying anything about anything. Which a San Diego judge actually upheld before it was shot down by another judge for being unconstitutional. SDCC sent a questionnaire to people around San Diego asking about the “Comic-Con” name. The results showed that 80% of the PEOPLE OF SAN DIEGO believed that the term “comic-con” was specific to SAN DIEGO and SDCC. Well, duh. If you ask me about “that burger place” I’m going to assume you’re talking about the one near me and not the one in another time zone. On the flip side, SDCC filed a sealed complaint asking for a new trial because . . . well, we’re not entirely sure why; it’s sealed. We only have what SDCC’s lawyers have said about it to go off of. And what they have said is absolute idiocy. In a Facebook post after the trial, Bryan Brandenburg (half of the team behind FanX) thanked the fans for their support and that this was the best possible outcome for them and they are very happy with the decision. Dan Farr, of Dan Farr Productions, then commented on his business partner’s passion for their creation. In opening and closing arguments, FanX’s legal team played on the sympathies of the jury by stating that blocking them from having future events would negatively impact the area and force Dan Farr Productions into bankruptcy. Even though the court ordered them to change names, and they agreed to change names, and have even started to rebrand and change names everywhere, SDCC does not believe that Dan Farr Productions actually intends to change names. Or if they do, they might change it back. No, I’m not kidding; that’s actually something a lawyer who is paid to do this said. After sending an apology and an “olive branch” gesture to the organizing body behind SDCC, Dan Farr “had the audacity to send a second email to [SDCC’s] Mr. Glanzer asking SDCC to ‘release’ its ‘Comic-Con’ trademark so that everyone could use it, suggesting that a public relations nightmare would otherwise ensue for SDCC.” That quote is directly taken from the motion filed. Dan Farr claimed immediately following the trial that the term “comic con” on Google pulled up more hits for Salt Lake Comic Con than it did SDCC. So, to paraphrase: SDCC has really lousy lawyers. They are filing for $4.5M because of that. Let’s break down these arguments. Firstly, when your brand has been sued and you LOST that case, the first thing you do is go into damage control mode with the people who back your brand. That means a Facebook post acknowledging what has happened and turning it into a positive so people are still excited about your brand. Think of ANY time a brand has had a misstep (exploding Samsung phones, anyone?) and how that company responded. Secondly, if you’re a lawyer at a jury trial, what else are you supposed to do during your opening and closing arguments? Insult the jury? Scream obscenities at them? And news flash, as the largest convention of any kind in the state of Utah that brings in an estimated $31M to the local economy, shutting down the event WOULD actually harm the area. Money aside, where else are we supposed to go for our “comic convention” fix? Did you really think that if Salt Lake Comic Con didn’t exist, all us Utahns would be traveling down to San Diego instead? Thirdly, are you an idiot? “We think that even though you’ve started to change your name and go through all that, you might just go ‘psych!’ and change it back!” Are you an actual idiot?! You filed a $4.5M lawsuit on that and then claimed that Dan Farr is responsible for the negative PR you’re getting?! Which leads to the next two points. Immediately after SDCC won its case against Dan Farr Productions, there was a wave of terror through the rest of the “comic convention” communities. Enough so that Phoenix Comicon (notice the spelling) changed their name to “Phoenix Comic Fest” to pre-emptively avoid getting sued. Every other convention in North America that uses some combination of the words “comic” and “con” are wondering when they are getting sued, as many of them (if not all) are actually older than Salt Lake Comic Con was. If SDCC goes after all of these groups the same way they went after Salt Lake, then they are going to be seen as the corporate bully and it WILL be a PR nightmare for them. Take Mr. Farr’s advice here, son; drop the trademark. The fact is that you were already being seen as a bully (and petulant child) by many outside of California, which is why immediately following the court ruling, many news outlets were running stories about how “Salt Lake Comic Con loses trademark dispute”. That’s why it was trending on Google! What are you going to do, sue every news outlet for not saying “San Diego Comic-Con wins”? Yes. It’s exactly that stupid. *That picture above is from neither convention! It’s Denver Comic Con, another convention that is now up for litigation!